This December 2015 needs more sources for reliability. Chemical warfare means using chemical compounds in war to injure or kill people. The chemicals used for chemical warfare are poisonous. Chemical warfare has been used since the Stone Age. Since 1899, several international laws have said that using chemical weapons is illegal. But chemical weapons have still been used in wars since then. Chemical weapons are different than regular weapons (like bombs) or nuclear weapons because they do not explode. Some chemical weapons are meant to kill people; they do this by poisoning them. Other chemical weapons are meant to "incapacitate" people (make them unable to fight back). They do this by causing pain, injuries, or sickness. Chemical warfare does not include using living organisms (like anthrax bacteria) to make people sick. That is called biological warfare. However, some living organisms make toxins (poisons). These toxins are not alive. For example, botulinum toxin is made by a bacteria, and ricin is made by the castor oil plant. Because botulinum toxin and ricin are not alive, using them to make people sick is called chemical warfare. This is explained in the Chemical Weapons Convention (CWC). The Convention also says that any toxic chemical is a chemical weapon unless it is used for legal reasons. About 70 different chemicals have been used or stockpiled (saved up) as chemical warfare agents during the 20th century. The Chemical Weapons Convention says that all of these chemicals should be destroyed. The Chemical Weapons Convention lists three different groups of chemicals. These are chemicals that are poisonous enough to be used as chemical weapons, or chemicals that may be used to make chemical weapons. Schedule 1 Substances (Chemicals): These chemicals can be used for nothing but chemical weapons (or for very few other things). Because of this, they may only be made or used for research; medicine; to make medications or antidotes; or for protective reasons (for example, to test chemical weapons sensors, which can tell when a chemical weapon is nearby, or to test protective clothing). Examples include nerve agents, ricin, lewisite, and mustard gas. If a country makes over 100 grams of any of these chemicals, the country must report this to the Organisation for the Prohibition of Chemical Weapons (OPCW). A country may have a stockpile of no more than one ton of these chemicals. Schedule 2 Substances: These chemicals have some specific uses other than chemical warfare, but not many. For example, dimethyl methylphosphonate can be used to make sarin, a nerve agent. But it is also used as a flame retardant. Another example is Thiodiglycol, which can be used to make mustard gas. But is also widely used as to make inks. Schedule 3 Substances: These chemicals have many uses other than chemical warfare. One example is phosgene. It can be used as a chemical weapon, but it is also an important chemical used to make plastics. Another example is chloropicrin, which has also been used as a chemical weapon, but is also used as a fumigant (for example, to kill insects in a house). The OPCW must be told of, and may inspect, any company that makes more than 30 tons of these chemicals in a year. How Did People Try to Protect Themselves? How Did People Recognize the Weapon? Although very basic chemical warfare has been used in many parts of the world for thousands of years, "modern" chemical warfare began during World War I (see the page Chemical weapons in World War I). Chemical warfare was first used during the Stone Age. Stone Age people used poisoned arrows and spear-tips. These were dipped in poisons, like venom from snakes or scorpions. Sometimes they used poisonous plants. The Ancient Chinese used different forms of poisonous smokes, when they besieged a city to try to take it over. The Ancient Greeks used a form of burning wood, pitch from plants, and sulphur. 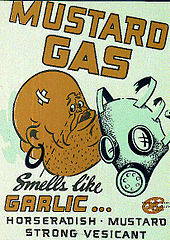 Poison gas was first used in World War I. France was the first country to make this type of gas. However, Germany was the first to use it in battle, on March 15th, 1915. On that day, they used tear gas against France. Phosgene gas: Phosgene caused people to cough and choke much worse than tear gas. 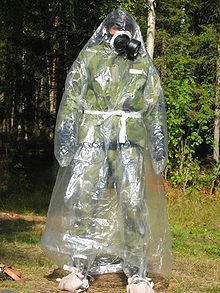 Phosgene gas is a very deadly chemical weapon. Historians think about 100,000 people died in World War I from chemical weapons. They also think that 85% of these people (85,000 people) were killed by phosgene. Mustard gas: Mustard gas was almost impossible to protect against. It caused very bad, painful sores on the outside and inside of the body. At first, very basic ways of spreading these gases were used. Even so, many soldiers could be hurt or killed. This was partly because World War I was fought usingtrench warfare, so many soldiers would be in the same place at the same time, and escaping from poisonous gases would be very hard. Germany was the first country in World War I to use chemical warfare in battle. They simply opened containers of chlorine upwind of enemy soldiers, so that the wind would carry the chlorine gas to their enemies. Soon after this, the French started using chemical weapons too. They filled artillery projectiles with phosgene and fired them at the Germans. This was a much more effective way of using chemical weapons. It would become the most common way of delivering chemical weapons during World War I. Chemical weapons were not used very much in World War II, except by the Japanese army during the invasion of China. This was because everybody was afraid that the other side would use weapons like theirs. Also, chemical weapons were not easy to use. They took time to use, and this made it harder for soldiers to move quickly. Also, the raw materials needed to make chemical weapons were not easy to get. This was because World War II was fought in areas which were not connected well by railroads. During the Iran-Iraq War, Iraq used chemical weapons (Iran did not). Many people believe that Iraq used chemical weapons against the Kurdish people. The United States has used chemical weapons even after World War II. For example, the U.S. used Agent Orange during the Vietnam War. It has been reported that many other countries, like the People's Republic of China, Cuba, Egypt, Iran, Israel, North Korea, Pakistan, Sudan, Syria, Taiwan, and Serbia and Montenegro, have chemical weapons. According to international law, it is wrong to use chemical weapons. Since 1899, there have been many rules that make it illegal to make, import, and use chemical weapons. The first international law to make chemical warfare illegal was the Hague Convention in 1899. After World War I, the Geneva Protocol of 1925 made it illegal to use chemical or biological weapons on people. In 1997, the Chemical Weapons Convention (CWC) was created. As of the end of 2015, 192 countries had agreed to follow the CWC. According to the Organization for the Prohibition of Chemical Weapons, as of October 2015, 90% of the world's chemical weapons stockpiles had been destroyed. If we use chemicals (like Agent Orange or glyphosate) to destroy plants, sometimes human beings may be affected by side effects. But, we will not call it chemical warfare. Chemical warfare covers only direct attacks on human life. ↑ Article 23. wikisource.org. Retrieved September 14, 2013. ↑ (July 29, 1899). Laws of War: Laws and Customs of War on Land (Hague II); Article 23. yale.edu. Retrieved September 14, 2013. ↑ "Disarmament lessons from the Chemical Weapons Convention". 16 June 2009.